Encouraging and nurturing the love of mathematics can be a challenge both at home and in the classroom. One way to support reluctant math lovers is to get them reading about math. There are many terrific books that include mathematical content or challenging puzzles to solve. Here are some titles that will encourage children to stretch their mathematical muscles in a different way. The Phantom Tollbooth by Norton Juster - Take a journey with Milo, a young boy who drives through a magic tollbooth into the Lands Beyond and embarks on a quest to rescue the maidens Rhyme and Reason from exile and reconcile the estranged kingdoms of Dictionopolis and Digitopolis. This is a great book for kids enamored of words and/or numbers. 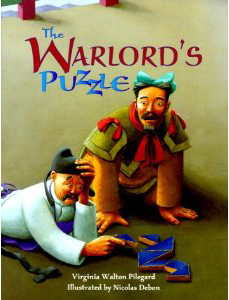 Grandfather Tang's Story: A Tale Told With Tangrams by Ann Tompert and The Warlord's Puzzle by Virginia Pilegard are both stories that revolve around an ancient Chinese puzzle made from a large square cut into seven pieces. The seven shapes include a small square, two small triangles, a medium-sized triangle, two large triangles and a parallelogram. Kids can read the stories and follow along with their own set of tangrams! You can print some tangram puzzles as well as shape outlines for young children. Try out some tangram puzzles online. The Number Devil: A Mathematical Adventure by Hans Magnus Enzensberger - With full color illustrations, this book tells the story of a twelve year old boy and math hater named Robert, who meets the Number Devil in his dreams. Over the course of twelve nights, the Number Devil illustrates different mathematical ideas using things like coconuts and furry calculators. 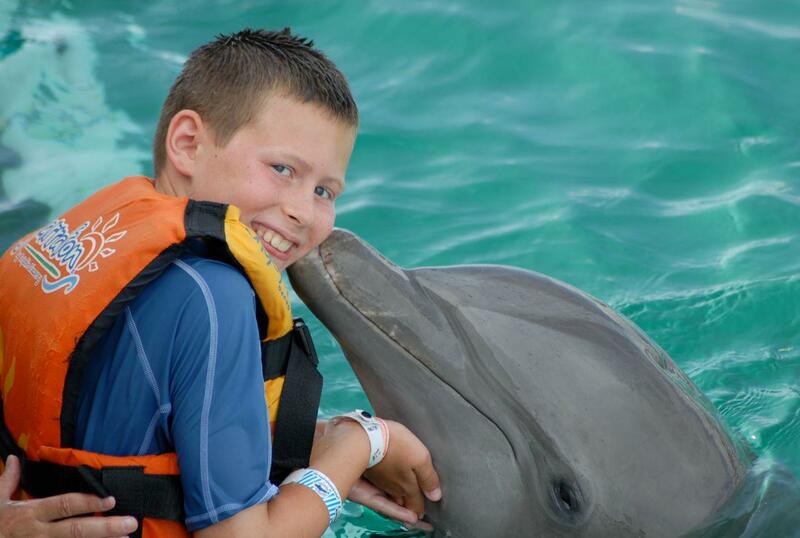 Along the way he also takes Robert to Number Paradise where he meets different mathematicians. 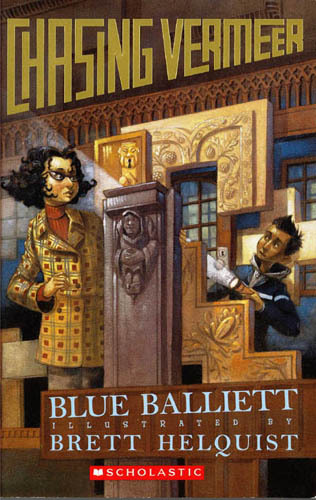 Chasing Vermeer by Blue Balliett - Petra and Calder are preoccupied with Vermeer. When a Vermeer painting is stolen in transit from the National Gallery in Washington D.C. to the Chicago Institute of Art, they become intent on finding the painting and solving the mystery. Clues and mysteries abound. Calder carries a set of pentominoes in his pocket at all times, so be sure to print your own set to use while reading this one! Learn more about the book, the author, and the other books in the series at the Scholastic site. Brown Paper School Math Books by Marilyn Burns - Don't let the publication dates fool you into thinking these are out of date (one was first published in 1975!). 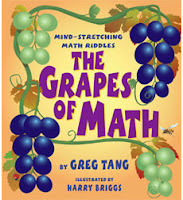 These are great books for helping kids see that math is fun and for everyone. The Mysterious Benedict Society by Trenton Lee Stewart - Eleven year-old Reynie Muldoon is intrigued by an ad in the paper that asks “Are You a Gifted Child looking for Special Opportunities?” Reynie and dozens of other children show up to answer the ad and take a mind-boggling series of tests, but only Reynie and three others are left at the end. Puzzles and mysteries abound in this adventurous tale. Sequels include The Mysterious Benedict Society and the Perilous Journey and The Mysterious Benedict Society and the Prisoner's Dilemma. After reading the books, try your hand at solving the puzzles in The Mysterious Benedict Society: Mr. Benedict's Book of Perplexing Puzzles, Elusive Enigmas, and Curious Conundrums. 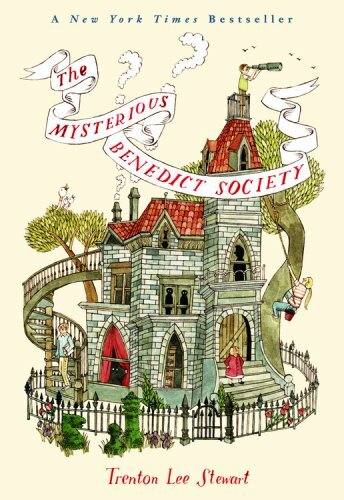 Play games for the gifted at the Mysterious Benedict Society site. Download and print some logic challenges. Get everyone involved and download the Family Reading Guide. Books by Greg Tang - Greg Tang has written a series of books that encourage children to look for patterns in math and find more "economical" ways of solving problems. 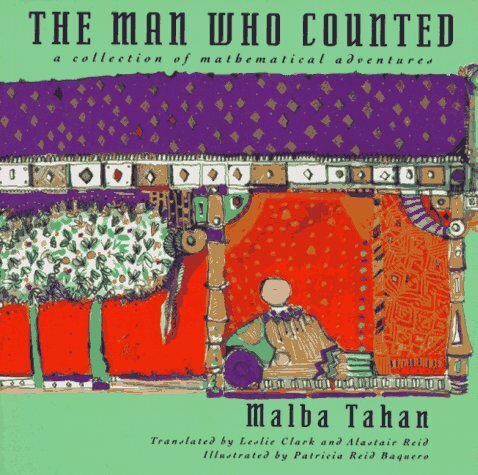 The Man Who Counted: A Collection of Mathematical Adventures by Malba Tahan - Orginally published in 1949 as O Homem que Calculava, this book of mathematical puzzles was written by Júlio César de Mello e Souza and published under the pen name Malba Tahan. 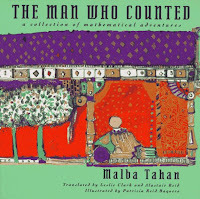 The book is an enjoyable series of "Arabian nights"-style tales, with each story built around a classic mathematical puzzle. In each tale, Beremiz Samir uses his mathematical powers to "settle disputes, give wise advice, overcome dangerous enemies, and win for himself fame and fortune." The Puzzling World of Winston Breen by Eric Berlin - Winston sees puzzles everywhere. Imagine his dismay when he gives his sister a box for her birthday, only to learn that it has a secret compartment containing four wood sticks with puzzle clues. Readers will solve puzzles right along with Winston and his sister Katie as they try to solve the mystery. The sequel to this book, The Potato Chip Puzzles, is also highly entertaining. 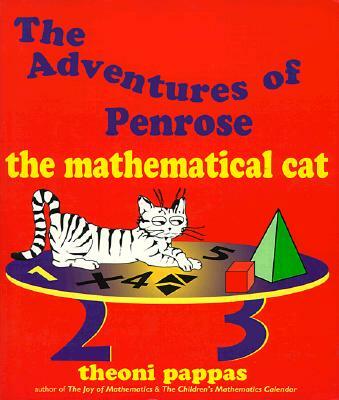 Books by Theoni Pappas - Written in the same vein as the Brown Paper School Books, Pappas has written many books about math, my favorites of which are those where a cat explores the math in and around his house. 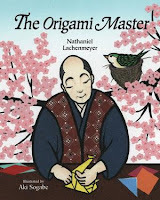 The Origami Master by Nathaniel Lachenmeyer, Lissy's Friends by Grace Lin (picture books), and Fold Me a Poem by Kristine O'Connell George (poetry) are all books about origami. Paper folding is a great visual and spatial puzzler for kids and adults. It's also fun! You can get great paper at Origami Corner. Try making this origami crane. Here are directions on folding an origami frog. You can also try this origami math lesson which includes a "fabulous frog" reproducible. If you have trouble reading origami directions in print, try following along with the videos on this site. Do the Math: Secrets, Lies, and Algebra by Wendy Lichtman - Tess is an eighth grade girl experiencing typical middle school problems--friends breaking promises, peers cheating on tests, the boy that may-or-may not be interested--as well negotiating some drama at home. Tess examines everything logically and views her world through the lens of mathematics. While the book isn't necessarily about math, Tess has many interesting mathematical insights and how they relate to the world we live in. That's it for now. 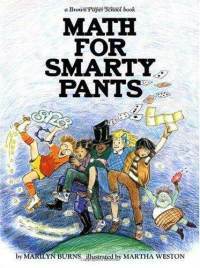 Do you have a favorite book that offers something mathematical to puzzle over? If so, please share. I would love to add your ideas to this list. We tried this form back in 2009, so it's time to dig it out and try again! The hay(na)ku and was created in 2003 by poet Eileen Tabios. Here are the guidelines. Need some examples? You can find some Hay(na)ku poetry contest winners at the Hay(na)ku Poetry blog. There is also a thoughtful essay about the form at Dragoncave. As you'll see from the examples, some folks create poems comprised of several hay(na)ku strung together. So, what kind of hay(na)ku will you write? Leave me a note about your poem and I'll share the results here later this week. On Poetry Friday I shared this poem by May Swenson. I have been reading a bit of May Swenson these days. I always read Analysis of Baseball each spring as a way to celebrate the return of the sport. Currently I'm ruminating on the poem below. The round up today is being hosted by Teaching Authors. Do stop by and take in all the wonderful pieces being shared this Veteran's Day. Before you go, check out this week's poetry stretch results. Happy poetry Friday all! Yesterday this little blog was 5 years old. I suppose I would throw more of a celebration if I was more productive than I have been in the last year and a half. A lot of the meaty, nonfiction stuff is appearing on the blog I now write with my students. Miss Rumphius, save for poetry, has been sadly neglected. Neglected and all, I'm still thinking about celebrations and commemorations. This Friday is Veteran's Day. Thanksgiving is around the corner. My dog just turned 14. There are lots of things we can celebrate and remember, from the grand to the small. What would you like to remember? Let's write about that this week. Leave me a note about your poem and I'll share the results later this week. I've been fiddling with the sestina as of late and having difficulty, so I thought a three word prompt might inspire me a bit. Since I'm still thinking fall, here are the three words I have been working with. Your challenge this week is to use these three words in a poem. Leave me a note about your poem and I'll share the results later this week. Fall is my favorite season. I'm so grateful I still live in an area where the leaves change color. Fall poetry inspires me almost as much as the season. I could live on a steady diet of Frost during these months. I've read and re-read October, Gathering Leaves, After Apple-picking, and Nothing Gold Can Stay. I've also spent time perusing Keats and Ode to Autumn. So, now that you're thinking fall, let's write about that. Leave me a note about your poem and I'll share the results here later this week. I was thinking about selecting words for a prompt today, but then decided it might be more fun is you could pick your own, within some parameters. So, here's the challenge. Head over to Fuse #8 and check out the titles on the Top 100 Picture Books Poll. Pick a title with at least three words. Write the words in the title down the page and use these words as the first line in your new poem. For example, if I chose IN THE NIGHT KITCHEN, my poem starter would look like this. And the starter for MAKE WAY FOR DUCKLINGS would look like this. Easy-peasy, right? Leave me a note about your poem and I'll post the results here later this week. Monday was a holiday for some folks, so I took fall break quite literally and completely unplugged for the weekend. It was wonderful, though I am a bit overwhelmed with e-mail at the moment. I had a bad day yesterday. My sister had a bad day too. Today it's rainy and kind of yucky. 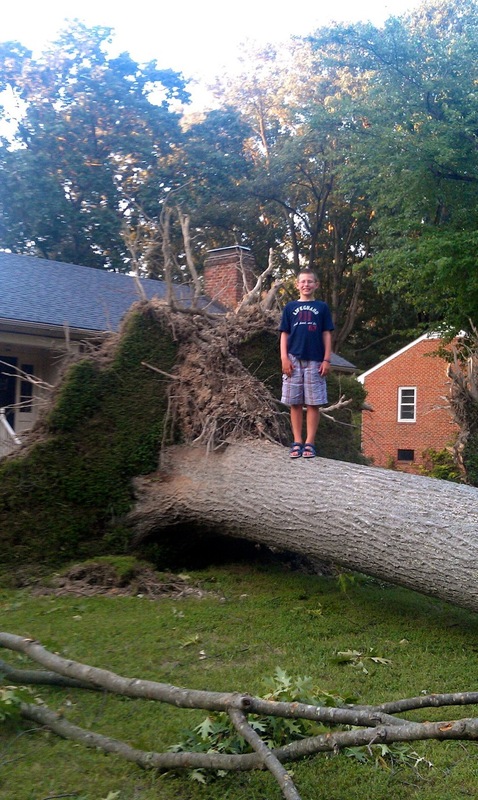 My son was looking forward to his first tree-climbing class, but it looks as though it will be canceled. So, while last week we wrote about what makes us happy, today I'm thinking we should write about what makes us sad. Too depressing? I hope not. Sometimes the strangest things bring on melancholy and longing. Yes, I'm late, but Mondays are horrible days. I also scheduled this to post, but had the wrong date and didn't check the calendar, so I was off anyway! Originally I wanted to write about things that make you happy, but this morning while stopping for a cup of tea, I saw two dogs outside my local coffee shop. They were both wagging their tails so vigorously that their whole behinds were shaking. If a sight like that doesn't make you smile, there isn't much that will. Babies make me smile, as do puddles (preferably ones I'm splashing in), bubble baths, the song Young Folks, Daniel Pinkwater talking children's books non NPR, and much more. So, let's write about what makes you smile. Leave me a note about your poem and I'll post the results here later this week. In the last week Virginia has experienced an earthquake and a hurricane. It's hard for me to look at these events and NOT be amazed by the power of the natural world. We were very lucky in both instances. I may be complaining about lack of power, but while others in our neighborhood lost trees and sustained damage to their homes and cars, we came out quite unscathed. So, I'm thinking this is a good time to write about the power of nature, whether it be earthquakes, hurricanes, tornadoes, or just a good old-fashioned rain storm. Leave me a note about your poem and I'll post the results here later this week. STEM Friday - What's for Dinner? Over at my new blog, Bookish Ways in Math and Science, you'll find an annotated bibliography on food chains. I wrote it as a sample for my students, who will soon be creating their own bibliographies for a range of topics in math and science. (If you want to the see the math sample, check out the post on ordinal numbers.) I hope you'll visit often and check out their work. In reviewing books for inclusion in the food chain post, I decided not to focus on nonfiction works about the food chain, but rather picture books and poetry. I was particularly taken with What's for Dinner? 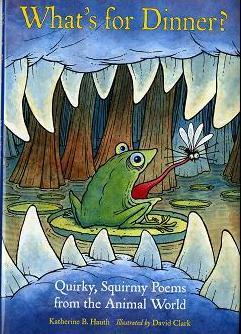 : Quirky, Squirmy Poems from the Animal World, written by Katherine B. Hauth and illustrated by David Clark. 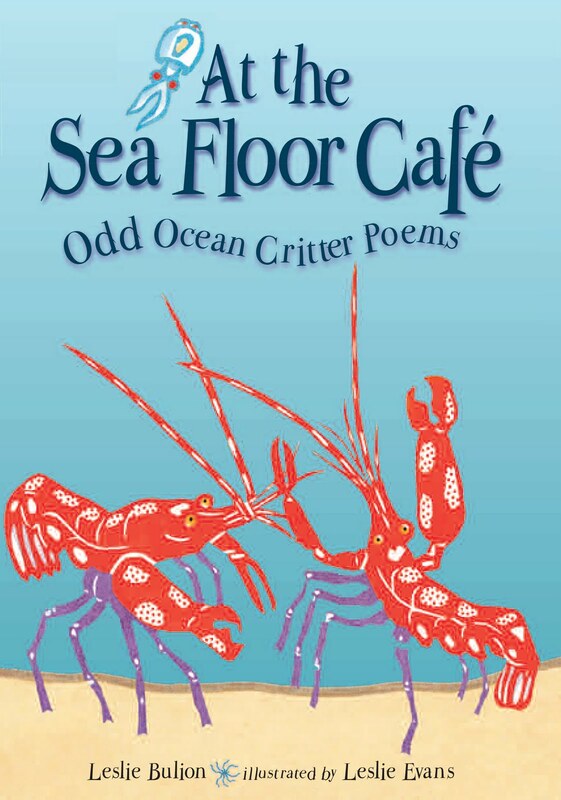 While the title may not indicate that this is a book of poems about organisms and where they fit in a food chain, one need only look at the cover to see fly--frog--big, nasty predator. Before even reading the poems you could engage students in a discussion of the partial food chain in this illustration. What kind of ecosystem is this? What are the likely producers? What do flies eat? What kind of animal might eat a frog? Inside readers will find 29 poems about a range of food chain topics. The introductory poem, "What's for Dinner," explains why animals must find food. What follows are humorous, graphic, scientific, inventive and just downright fun poems. Accompanied by equally graphic and humorous illustrations, the perfect pairing of word and art gives us a book that readers will love. In the poem entitled "Waste Management," a rather haughty-looking vulture pulls at a strand of the innards of a carcass while standing on the exposed ribs. Here is the poem that accompanies it. the vulture rips up carrion. which saves us all from stink and germs. While most of the poems are about animals, the last entry, "Eating Words," uses poetry and word roots to define insectivore, carnivore, herbivore, and omnivore. The back matter includes a section entitled More Words About the Poems, which explains a bit more of the science and further explains vocabulary terms such as symbiosis, parasitism, mutualism, commensalism, and more. More Words About the Animals provides background information for each of the poems. Here's the text that expands on the poem "Waste Management." Turkey vultures don't have strong beaks and feet. They can't tear into tough hide and muscle until it's been "tenderized" by decay. A turkey vulture's featherless head and neck may look strange, but skin is easier to clean than feathers after the bird plunges its head into a rotting carcass. The final page of the book provides some additional titles for learning more about the animals in the book. Overall, this is a fine book for readers interested in predators and prey. HIGHLY RECOMMENDED. 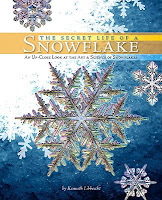 For more information about the book and its author, download the file Author Spotlight with Katherine B. Hauth. This post was written for STEM Friday. Today's round up is being hosted by Anastasia Suen at Picture Book of the Day. Do stop by and see the great books being shared for Science, Technology, Engineering and Mathematics (STEM). This got me wondering about what my postcard from summer would look like. So, that's your challenge. Write a poem, "find" a poem, draw a picture, or stretch in some other way, but share with us your poetic postcard from summer. Leave me a note about your work and I'll post the results here later this week. Within these categories you'll find topical lists by grade level. The book lists can be downloaded in Excel or .csv format and include basic information as well as interest level, reading level (grade equivalent), lexile framework, and more. The web page for each book list often includes links to teaching resources for particular titles. Once you're done exploring the 100 highlighted lists, you can check out Scholastic’s List Exchange, which features thousands of shared Book Lists. You can even create your own book lists. Hats off to The Atlantic for their piece 24 Songs The Prematurely Expanded Our Vocabularies. Here's how it begins. Lyrics in popular music have been blamed for social ills ranging from drug use to the London riots. But as back-to-school season approaches, it's worth pointing out how Top 40 radio can make people smarter—by teaching them new words. Check out the article for songs, lyrics, and video clips. You'll find the Beatles, Blink 182, Nine Inch Nails, David Bowie, Paul Simon, Liz Phair, Rihanna, and more. What fun! What happens when a poet receives a blank postcard and is asked to fill it in, in any way, and mail it back? The Academy of American Poets asked this very thing in June and the postcards are trickling in. Check out the results at Poets Via Post. I was struck by the number of poets who chose to use pictures instead of words. Given the time of year, I'm quite drawn to E. Ethelbert Miller's baseball poem. Have you seen the article Peter Pan's Neverland could become forever-land? Here's an excerpt. For the teenager James Matthew Barrie, the sloping, terraced garden overlooking a gentle river was an enchanted land where he and his friends became pirates, clambered over walls, built hideouts and scaled trees in the sunshine. But the back garden of Moat Brae, a late Georgian villa in the rural town of Dumfries, became more than a playground for the aspiring novelist and playwright. Thirty years later, it inspired Neverland, the magical kingdom where Peter Pan and Tinkerbell flew into battle against Captain Hook, an adventure that captured the imaginations of millions of real-life children. Now, nearly 140 years after JM Barrie played there as a boy, the mansion and gardens are to be transformed into a national centre for children's literature, after the derelict and decaying building and its garden were saved from demolition by a local trust. Read the article in its entirety at The Guardian. The writers at Stylist Magazine has selected what they believe are the 50 most poignant lines of poetry ever written. The lines are connected to images. The first image is a bird. Can you guess the line? Here's a hint, it's Dickinson. You may not agree with all the choices, but it is an interesting read. I also had a bit of fun trying to guess the lines based on viewing the images. Check it out at 50 of Poetry's Most Poignant Lines. Favorite quote: "If there is a basketball court in every single elementary school, then there needs to be science programs. It needs to be a priority. It needs to be mandatory." Did you hear that Random House will be publishing a collection of seven tales by Seuss that were originally published in Redbook between 1950 and 1951? Come September you can find them for the first time in book format. Read more about this at Random House to Publish Lost Dr. Seuss Stories. Quick! 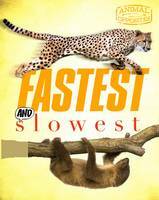 Before you peak at the cover to the left, what animals come to mind when you think about speed? Which ones stand out as slow? When my son handed me this book and I saw the cheetah and sloth on the cover, I didn't think there would be much new ground to cover. However, I was pleasantly surprised by the organization of the book and the variety of animals described. This title in the Animal Opposites series is divided into a series two-page informational sections. It begins with On the Move which provides a brief introduction to types of animal movement. The next section, A Need for Speed, explains why speed is often key to a species survival, whether it be to catch prey or avoid becoming a meal for someone else. Go Slow further explains that some animals use lack of speed for survival as well, moving so slowly that they are more easily camouflaged. Additional sections focus on swimmers, flyers, runners, diggers/burrowers, climbers, slitherers, mini-movers, weird walkers, energy savers, and growers. The double page spreads are filled with vivid photographs and sidebars that describe animal record breakers or show others in actual size (ruler-included). To get a feel for the book's layout, take a look at these sample pages. While the topics are covered with more breadth than depth, there is an amazing wealth of information and odd factoids that many students will find engaging. Here are some of the interesting things I learned while reading this book. Gentoo penguins are the fastest underwater birds, reaching a speed of 22 miles (36 km) per hour in short bursts. One mole can dig 65 feet (20 meters) of tunnel in a single day. The Potoo bird spends all day motionless where it positions itself in a tree and mimics a branch. The book contains a table of contents, glossary of terms, index, and activity suggestions for parents and teachers. Overall, this book will appeal to reluctant readers, as well as kids with an interest in animals. This book was written for Nonfiction Monday. Today's host is Amy O'Quinn. Do stop by and check out the titles being shared this week. Every so often I revisit the articles written by James Fenton for his poetry masterclass. In the article To villanelle and back, Fenton looks at a variety of forms and the challenges they pose. I was particularly taken with this excerpt. John Fuller, in response to a competition challenge, set out to write a poem consisting only of three-letter words. And in order to add to the interest, he decided on a form in which there were three three-letter words per line, and the lines came in groups of three. What an interesting idea! Here is how the resulting poem begins. This amazing poem has me wondering what kind of poems can be crafted using only three-letter words. That is your challenge. Leave me a note about your poem and I'll post the results here later this week. If you liked Lev Grossman's book The Magicians (I know I did) and are looking forward to reading the sequel, The Magician King, then you'll enjoy this article. In Writing the Magician King, Grossman describes the process of writing the novel. It's an interesting story, with some nice insights into the life of a writer. Here's an excerpt. There’s a reason they don’t have reality shows about writers: it’s not visual. There’s nothing to see and not much to tell. When you’re really getting stuff done, you’re just sitting in a chair with a laptop and trying to type fast enough to keep up with the movie in your brain. That’s the glamorous life of the writer for you. To learn more about the book, check out Upping the Ante: A Review of Lev Grossman's The Magician King. I spent the afternoon at the pool with a well-worn copy of Leaves of Grass. My reading inspired me to share this poem. As I watch the bright stars shining—I think a thought of the clef of the universes, and of the future. This vast similitude spans them, and always has spann’d, and shall forever span them, and compactly hold them, and enclose them. The round up is being hosted by Karen Edmisten. Do stop by and take in all the wonderful poetry being shared this week. Happy poetry Friday all! 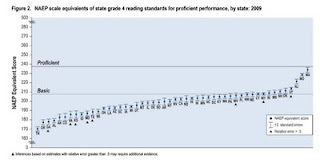 The National Center for Education Statistics just released the report Mapping State Proficiency Standards Onto the NAEP Scales: Variation and Change in State Standards for Reading and Mathematics, 2005-2009. This report compares the standards that states use in reporting 4th- and 8th- grade reading and mathematics proficiency using NAEP as a common metric. Here's the gist of the report and why I use the word discouraging in the title of this post. There is wide variation among state proficiency standards. 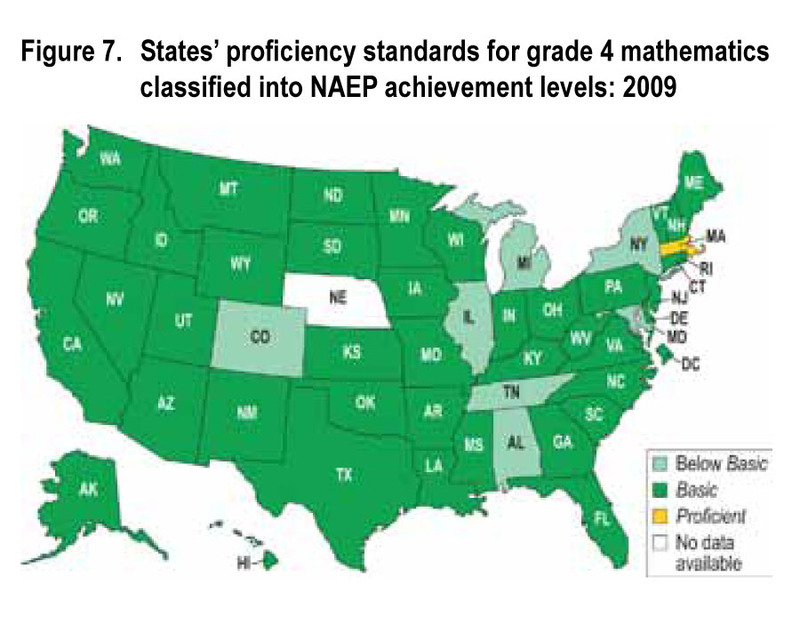 In 2009, using NAEP as common metric, standards for proficient performance in reading and mathematics varied across states in terms of the levels of achievement required. 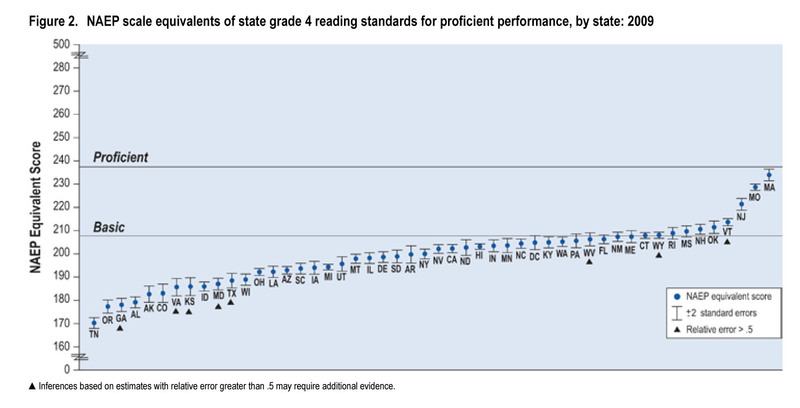 For example, for grade 4 reading, the difference in the level required for proficient performance between the five states with the highest standards and the five with the lowest standards was comparable to the difference between Basic and Proficient performance on NAEP. 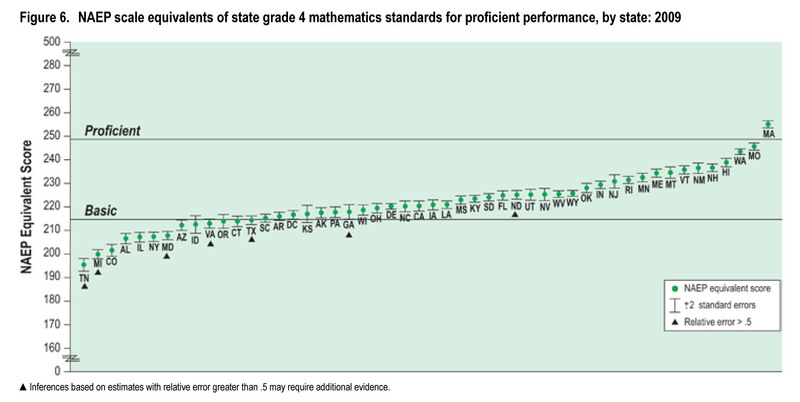 Most states’ proficiency standards are at or below NAEP’s definition of Basic performance. 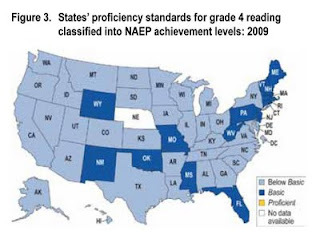 In grade 4 reading, 35 of the 50 states included in the analysis set standards for proficiency (as measured on the NAEP scale) that were lower than the scale score for Basic performance on NAEP and another 15 were in the NAEP Basic range. In grade 4 mathematics, 7 of the 50 states included in the analysis set standards for proficiency (as measured on the NAEP scale) that were lower than the Basic performance on NAEP, 42 were in the NAEP Basic range, and one in the Proficient range. Are you interested in seeing where your state fell in this mix? 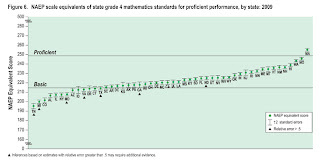 Here are some graphics of the fourth grade results to help you better understand. Click to enlarge. We use the revised version of Bloom's taxonomy in teaching our candidates how to write objectives and plan for instruction and assessment. 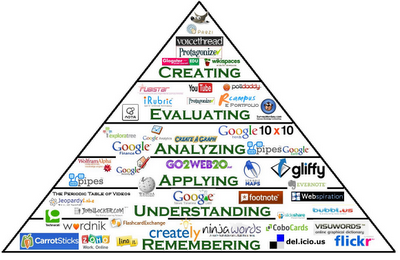 As they plan, we also want them to think about all the tools appropriate for instruction, including technology. The Bloom's Digital Taxonomy Pyramid makes thinking about technology tools in this context a breeze. For each level, direct links to a number of web applications that can be used to support instruction are included. (The above work is licensed under a Creative Commons Attribution-NoDerivs 3.0 Unported License. Even if you don't teach, you'll find something here of interest. As a word lover I'm crazy about Visuwords, Wordnik, and Ninjawords. The visual learner in me loves Creately and Gliffy. I hope you'll join us over at Bookish Ways in Math and Science. The blog will be devoted to using children's books in teaching elementary math and science, though I have no doubt some books for social studies will make an appearance. Case in point is my first post on books for going back to school. I've been pondering a recent post on graphic novels and following the comments with interest. The post, Wondering (Worrying?) About Graphic Novels takes a rather short view of the genre. Here is an excerpt. I can hear graphic novel enthusiasts everywhere groaning as I type—and I’m all-too-familiar with the argument that graphic novels require students to make meaning from pictures, drawing subtle inferences based on what they’re seeing. Let’s be honest, y’all: Graphic novels ALREADY take away the need for students to visualize anything while they are reading. Will students who are hooked on graphic novels ever be terribly excited about picking up a text where they’ve got to do the imagining on their own again? Think about it: Can YOU imagine trying to imagine—or wanting to imagine, or seeing a need to imagine—after discovering an entire genre where imagining just isn’t necessary? Interestingly enough, when I taught a course on Content Area Reading for middle and secondary teachers a number of years ago, I included Maus I: A Survivor's Tale: My Father Bleeds History and a few of Larry Gonick's Cartoon history books. Mind you, this was before the explosion of graphic novels, so the pickings were slim. However, there are so many terrific books today. Do I agree with Bill Ferriter? HECK NO! First, let me give you a personal response. I have a ten-year old who spent all of fourth grade reading through the Percy Jackson books. It ignited an interest in all things mythological. He's since read a number of mythology books, most recently Mary Pope Osborne's Favorite Greek Myths and Tales from the Odyssey, Part 1 and Part 2. In the mix of books you'll find the first three titles in George O'Connor's Olympians series. (You can read more about George and his work at Seven Imp.) These graphic novels distill the stories of each Olympian into 80 vibrant, action-packed pages. They have been read and re-read by my son. And honestly, they leave him wanting more, not less. Okay, now for a more academic response. The graphic novels being published today demand readers engage in the same kinds of skills needed to make sense of more "traditional" literary works. The notion that "real reading" doesn't occur while students interact with the text of a graphic novel is simply false. Sometimes this genre may even require more finely honed skills, as readers are required to make sense of a range of literary devices (think about the complexity of narrative structures in a graphic novel) and vocabulary that can be more advanced than other books written for students of the same age. Check out the article The Case for Graphic Novels in Education that responds to this issue much more eloquently than I have. If you are interested in learning more about graphic novels in the classroom, check out these links. Check out the Cybils blog for winners and nominees in the graphic novel category. So, what do you think of graphic novels? Leave me a note here or head over to Wondering (Worrying?) About Graphic Novels and leave your thoughts there. I have been grappling with the sestina as of late. My attempts have been less than successful, so I've decided to step back and try a simpler form, the tritina. Helen Frost has a number of worksheets on poetic form on her web site. She suggests starting with the tritina since the sestina is a more difficult form. What a great idea! Here are the nuts and bolts of the form. So, your challenge is to write a tritina. Leave me a note about your poem and I'll post the results here later this week. Have fun! I have been reading Merwin for some time now. A book of his poetry accompanied me on our recent trip to Mexico. The poems somehow seemed fitting of the place. He is quite an interesting man. Here's an excerpt from The Poet's View in which he recounts meeting Ezra Pound, describes how his poetry is a reflection of how he lives, and reads a poem he wrote for his wife. Merwin's nature poetry is what first drew me to his work. He still writes about nature and is a strong advocate for conservation. In fact, he recently gave the keynote address at this year's Hawaii Conservation Conference. You can read more about it in the article entitled US Poet Laureate Says Humans Failing Themselves. The round up is being hosted by Libby at A Year of Literacy Coaching. Do stop by and take in all the great poetry being shared this week. Happy poetry Friday all! What Math Skills in Early Years Are Key to Later Success? Here's some interesting news on the research front that has tremendous implications for teachers of young children. Psychologists at the University of Missouri monitoring a group of 177 elementary students from 12 different elementary schools since kindergarten have identified the math skills students should have in the first grade to have success by the fifth grade. After factoring out intelligence, working memory and other abilities, researchers were able to determine the most critical beginning-of-school math skills. Researchers found that beginning first-graders that understand numbers, the quantities those numbers represent, and low-level arithmetic will have better success in learning mathematics through the end of fifth-grade. They also found that first-graders who understood the number line, how to place numbers on the line, and those with some knowledge of basic facts showed faster growth in math skills than their peers during the next five years. Every so often I have a student looking for reading ideas that incorporate American Sign Language. I am thrilled to report that the Illinois Service Resource Center has made available ASL Literacy Packets based on seven popular children's books. Each packet includes three literacy activities, a list of vocabulary words in which each word is defined and the sign is described, photographs showing the proper way to make each sign, and all reproducibles needed for the activities. Each packet can be viewed as an e-book or download as a PDF. These look like useful resources. Check them out at ASL Literacy Packets. I am thrilled to report that the amazingly talented Denise Johnson, author of The Joy of Children's Literature and professor of reading, language and literacy at the College of William & Mary, will be hosting a new children's literature conference this fall. Here are the details! The conference will be held Saturday, October 15th from 8:00 - 5:00 at he College of William & Mary. The cost of the full conference is $100 (breakfast and lunch included). The deadline for registration is October 3, 2011 or until the conference is full. If you are in Virginia or somewhere close by, I hope you take advantage of this wonderful opportunity. I know I will! Please visit the Joy of Children's Literature Conference site for a registration form and more information. We had a wonderful break. Lots to tell, but this picture just about says it all. I know we'll look back on our time away with great fondness. While William gets to enjoy what's left of summer, I'm back at work and preparing for fall. Faculty return on the 15th and classes begin the 22nd. I regret to admit that my summer is officially over. While this makes me sad, I'm thrilled to be back with you.